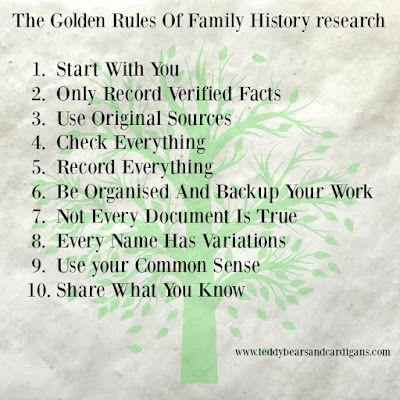 Anyone who has ever done any serious family history research will tell you there are rules that you must follow. 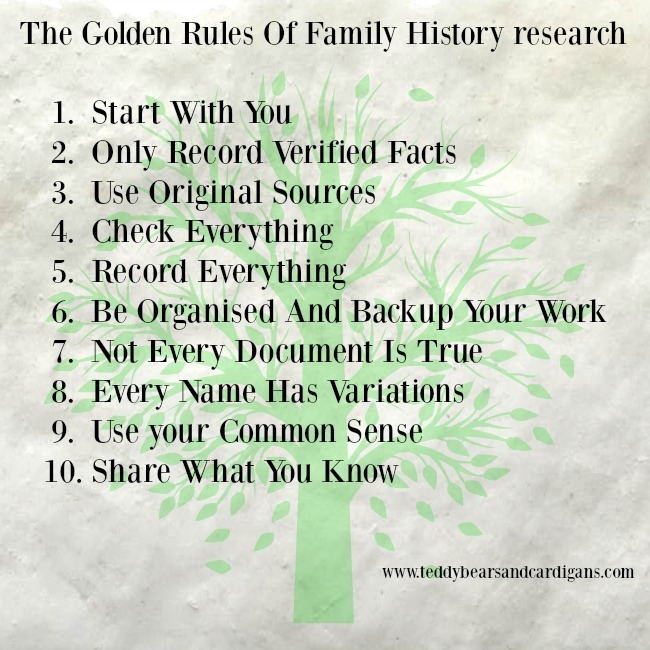 In almost every guide about Family History Research these rules will be there in one shape or another. 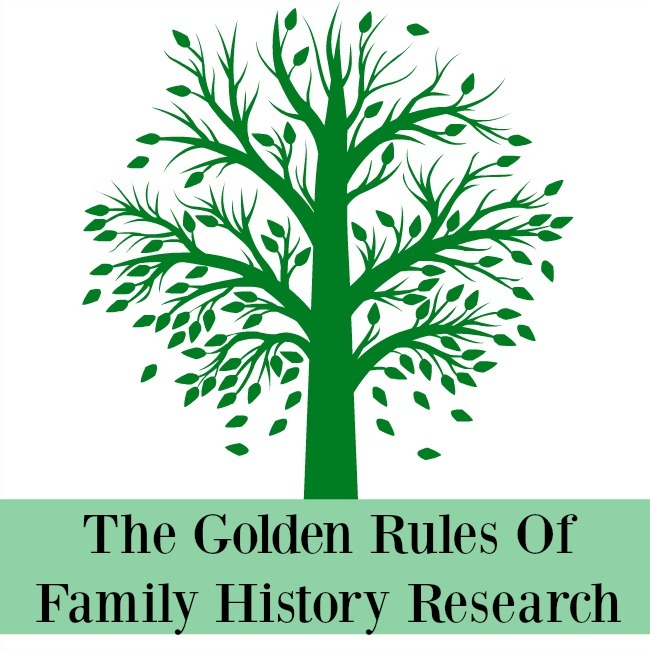 I have pulled together all the advice I have read over the last eight years and all the lessons learnt from my mistakes, and there have been many, and written The Golden Rules Of Family History Research. When I started researching my family history I just knew I would remember my sources and I quickly found a tree on-line that gave me Portuguese ancestors. I was thrilled until I looked again and then checked again and it didn't add up. They had all their research wrong and I had blindly copied it. Never again. So a piece of advice, read the rules and do your best to follow them. This might seem obvious but start with you and work backwards one generation at a time. Don't jump to famous people you may be related to! Work your way backwards one generation at a time. My simple guide to how to do this can be found here. Have a tree that is only proven facts. Only put people into that tree that you have researched and you are sure belong there. Do not include guesswork or surmises. I have more than one version of my tree. One is my researched tree that I know belongs to me, another is a work in progress. If I find someone that I think might be related or is living with an ancestor and I don't know the relationship I put them here. Only when I've proved it do I add them to my tree. How do I prove it? I use multiple original sources. An original source is exactly what it says. It is the document that recorded the event. A transcript of a parish register is not an original source; the parish register is. The birth, marriage and death index is not an original source, the certificate is (If original or certified true. Hand written copies are also open to error). All transcripts are at the minimum secondary sources, they are an invaluable resource to help you find the original but can not be relied on. My father's first names are recorded as Daniel Malcolm in the BMD1 indexes. It is a mistranscription. He is David Malcolm. Whoever transcribed the original couldn't read the handwriting and thought David was Daniel. Check everything and before you record it check again. Most family historians say that you need three original sources to prove each ancestor in your tree. This isn't quite so difficult for people born after 1837 as there are certificates, census, probate, newspapers and more. The further back your tree is traced then this gets harder. I am happy with two if they are good quality. For example a parish entry and a headstone or a will. Write it down. Either on paper or on the computer preferably both. What you found, where you found it, how you came to that decision. I have a line that I know I researched thoroughly but can I find the information to prove it? No, I just didn't write it down and now I can't link that branch into my tree. Choose a system to record what you find, there are lots of free resources online, and keep a back up. Record all your direct ancestors with their surnames in capital letters, John SMITH. It makes it so much easier to follow your direct line back to you. Be precise and diligent when recording dates and places. Use the same format throughout and don't use numbers for months. The USA has their month first, then the day, then the year. The UK has day, month, year so already there is scope for confusion. Use all four digits of the year. So record as 4 Jan 1986 or Jan 4 1986 not 04/01/86. Record place names in full. There are 28 places named "London" listed on wikipedia. So if it's London, England record that. Although original certificates should be true documents many people lied either knowingly or thought they had the correct information at the time. Fathers and fathers occupations are quite often wrong especially if illegitimacy or bigamy is involved. My great grandmother has her father as Phillip Lang Sturley on her birth certificate and Phillip George Beeton on her marriage certificate. Census records are also transcriptions of schedules and are open to error. Many people couldn't read or write and didn't know exactly when they were born. Some just hid details or lied. Other researchers may not be as diligent so never assume it's accurate. Use their work as a guide then check it all yourself. As mentioned before people were unable to read or write and so their names were written, often phonetically, by someone who was literate. This meant that there were variations of a persons name even during their lifetime. Get to know all the different spellings of the names you are researching and be aware of common mistakes when they are transcribed and check them all. Just to illustrate with one example of variations of a common surname "Phillips". So with or without a S there are at least 24 variations and probably many more. The Ph could be changed to F and double the number. You conduct a search and only one person fits so it must be the one you are looking for? Well it may be but equally it may not. Not all databases are complete. That's why more than one record is needed. I have seen so many online trees where the parents are younger than their children or much too old. Check the facts then add some common sense. Join forums, groups and Family History Societies. Share what you have found and others will share with you. You can pin or save the above to keep as an easy reminder of the rules. Don't forget to enjoy researching your tree. Remember that it's not about getting a list of names it's about finding out who your ancestors really were and what their lives were like. 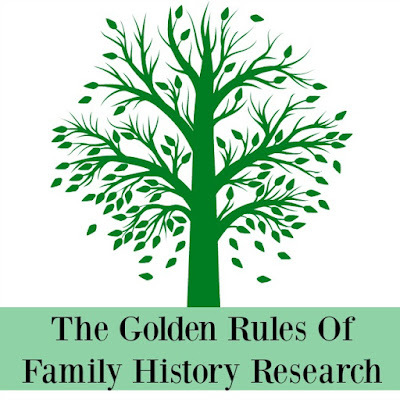 This is the first in a series of posts about researching your family tree. If you would like to read more in this series please click on the "Family Tree" part of the badge below or the Family Tree tab at the top of the page.